Precious G.E.M. 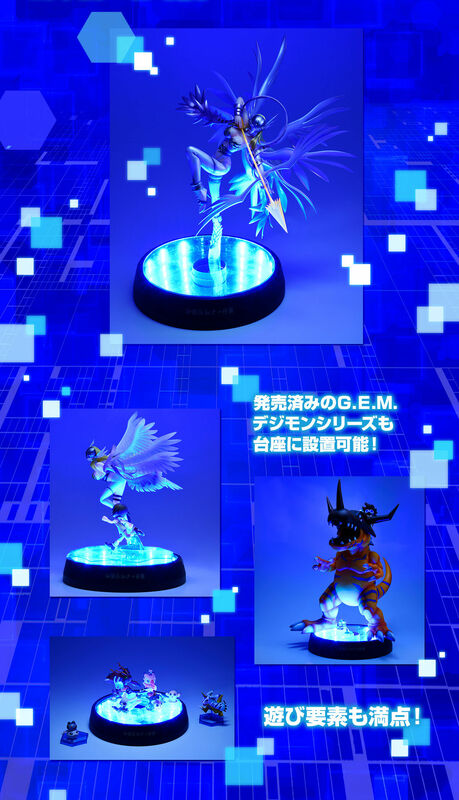 Series Digimon The third version is how Enjoumonn descends again! Three-dimensional moment of releasing a Special Move "Holey Arrow" was made. This time it is a solid shape with a total height of about 270 mm, a cool appearance releasing a deathblow "Holey Arrow"! Modeling is also made from the animation setting conscious of the original version, and of course designer Watanabe Kenji is thoroughly supervised! A pose that shoots big-open angel's feathers and arrows is dynamic! Nevertheless, it is a finish that you want to feel in hand. In addition, this time the shiny pedestal that reproduces the effect of the Holey Arrow as much as possible so that you can enjoy the display more! The color is Digimon Blue. Of course this product is, however, DigiColle! And G.E.M. The play elements that you can enjoy on the series are also perfect items. Angewomon figure is absolutely perfect. It looks like a lot of thought was put into creating her. She looks great next to all my other Digimon figures. The pedestal is very bright. My only issue is that I accidentally scratched the arrow as I was trying to place it on her hand, but that’s hardly noticeable. All in all I’m glad I made the purchase.